Transcriptional repressor which forms a negative regulatory component of the circadian clock and acts independently of the circadian transcriptional repressors: CRY1, CRY2 and BHLHE41. In a histone deacetylase-dependent manner represses the transcriptional activator activity of the CLOCK-ARNTL/BMAL1 heterodimer. Abrogates the interaction of ARNTL/BMAL1 with the transcriptional coactivator CREBBP and can repress the histone acetyl-transferase activity of the CLOCK-ARNTL/BMAL1 heterodimer, reducing histone acetylation of its target genes. Rhythmically binds the E-box elements (5'-CACGTG-3') on circadian gene promoters and its occupancy shows circadian oscillation antiphasic to ARNTL/BMAL1. Interacts with the glucocorticoid receptor (NR3C1) and contributes to the repressive function in the glucocorticoid response. 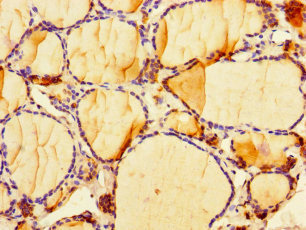 CIART Polyclonal Antibody. Unconjugated. Raised in: Rabbit.